Chefs are flocking, new hotels are opening, and the film festival is rapidly growing: The city of Toronto now has more reasons to visit than ever. Find out what to see, do, eat, and drink while in this booming Canadian city! Charming Porter Airlines flies into Billy Bishop Toronto City Airport, a small airport on an island at the city's edge. A quick ferry ride brings you straight into the city, minimizing travel time (alternatively, Toronto Pearson International Airport is located 14 miles northwest of Downtown Toronto). In other words, half an hour after you've picked up your bags, you can check into your hotel and head out for a stroll! Plus, they still offer extras like free drinks and snacks, both on board and in the airport lounge. Check out some of our Canada travel deals here! Several neighborhoods in Toronto are worthy of an afternoon of exploring on foot, but Queen West is packed with of-the-moment attractions. There are a couple boutique hotels – Drake Hotel and Gladstone Hotel – that are a good match for design-conscious travelers as well as opportunities to engage in the local art scene, including the Museum of Contemporary Canadian Art (MOCCA). This cool neighborhood also has plenty of enticing sidewalk cafes and watering holes for people watching. 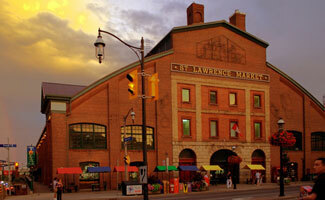 If grazing is your preferred method of eating, spend the lunchtime hours wandering through the St. Lawrence Market. The space has housed markets since 1803, and today's covered market hall attracts locals shopping for everything from meat, to fish, and fresh produce. Amongst the stalls are ready-to-eat options including sandwiches for nibbling, cheeses for sampling, honey for tasting, and plenty of sweets to round out your meal. For a more in-depth introduction to the market, check out tours led by Bruce Bell. The spirit of forward movement in Toronto might best be summed up by Evergreen Brick Works, a once abandoned brick factory turned environmentally friendly community center. A charity called Evergreen reclaimed the former industrial site with an eye on urban sustainability and planned a variety of activities from a Saturday morning farmer's market to a Children's Garden where kids can get their hands dirty. The site is surrounded by miles of hiking trails, perfect for a picnic on a sunny day (pick up supplies at the in-house restaurant, Café Belong). The brand new Four Seasons Toronto in Yorkville is home to an impressive 30,000 square foot spa on the 9th floor. It's is the largest day spa in the city, with a sunny indoor pool and outdoor terrace overlooking the Toronto skyline. Huge locker rooms with plush lounge areas and 17 treatment rooms provide an opportunity for some well-deserved pampering. Treat yourself to a massage and personalize the experience by selecting everything from music to aromas. Though it is a splurge (massages start at $110), it is well worth it in this impressive space. It is fitting that the former Whiskey Distillery District in Toronto is now a pedestrian-only place for an afternoon cocktail. This labyrinth of red brick Victorian buildings and cobblestone streets dates back to 1832. The art galleries and shops are worthy of exploration, but for those looking to kick back with a drink, you can choose between a revitalizing hot chocolate at Soma Chocolate or a craft beer at the Mill Street Brewpub, among others. These highlights scratch the surface of all to see in today's Toronto. Spend a few days in "Toronno" – as the locals pronounce it – and you will find many reasons to return. Did we miss anything on this list? Tell us your favorite spots below!